"Try and solve these puzzles using logic"
Game Goal: Use logical reasoning to solve different puzzles and save Rube's lab. How to Play: Use the objects in the laboratory to activates the mechanism to break the bubble that protect the diamond. With diamonds you get tips to help solve puzzles. Graphics: The laboratory is designed with little detailed 2D graphics, you can focus on the options available to solve the puzzles. Controls: The game interface is quite intuitive, you just have to touch the screen to activate the objects. Rating: The TOP 5 Most popular games in Physics Games category. Ranking: The TOP 5 Most downloaded games in Physics Games category. 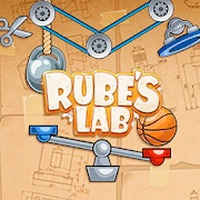 Do you like Rube's Lab - Physics Puzzle? Learn physics with this fun game! Show your skills in this fun archery challenge!